We’re excited to let you know about the 2012 College and Careers Retreat! College and Careers Retreat is a fun, motivating week at Deroche Retreat. The retreat will run from Monday, August 27 to Friday, August 31. Along with social activities, games, fellowship and worship, Jeffery Temple will be presenting a lecture series titled ‘Faith in Action’. College and Careers Retreat is a vital part of your spiritual formation as a student or young working professional. It’s a chance to hear powerful, gospel centred messages, worship with your peers, and enjoy the beauty of God’s creation free from the distractions of home, school or work. You’ll find your faith strengthened and friendships formed as you spend a week away focusing on God and enjoying a number of fun activities with friends both old and new. A lecture series titled ‘Faith in Action’ will show how the gospel is alive throughout history, how it impacted people in the time of the reformation, and how it is impacting the world today. The Deroche Retreat is a 160 acre mountainside property located 80km east of Vancouver, British Columbia, Canada. The Retreat features stunning valley views, spacious fields and moderate facilities. Deroche Retreat is a place of beauty and isolation—a grand display of God’s creative work. Cost to attend is $198.00 per person. Initial registration requires a $50 deposit with the remaining amount due August 18 2012. 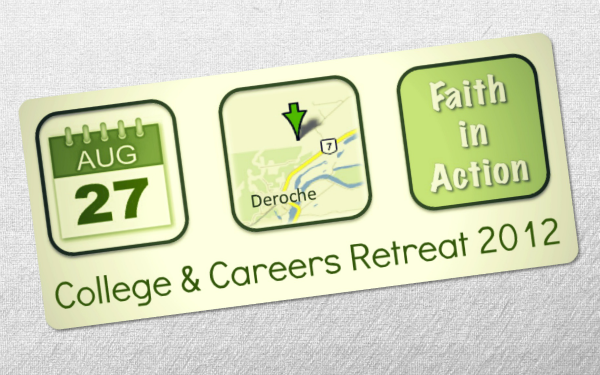 Registration for 2012 College & Careers Retreat is limited to approximately 25 guests. In order to ensure a spot, register soon. Registration ends August 18, 2012.